1. A 105 K 250 volt AC capacitor is dropping the 230volt AC to low volt AC. 2. Bleeder resistor R1 is used to remove the stored current from the capacitor. See without this resistor, the voltage in the capacitor can be as high as 400 volts and will be present many days in the capacitor. So it can give a shock if the plug is touched. The resistor will bleed the current immediately at power off. 3. D1 through D4 rectifies the low AC to DC and capacitor C2 makes the DC ripple free. 4. Around 20 volts DC with a current of 100 mA will be available from 105 K (1uF) capacitor. In capacitor power supply, as a rule there will be 100 mA current per uF of capacitor. 5. Remaining part is simple. Switch S1 is two way. When it is placed to one end, current passes through D5 to charge the battery and to light LEDs. If the switch is in the other position, Lamp turns off. 6. When the mains power is off, D5 reverse biases and D6 forward biases. LEDs light using the battery power. Caution: This circuit uses high volt AC directly. So it can give a lethal shock if touched. 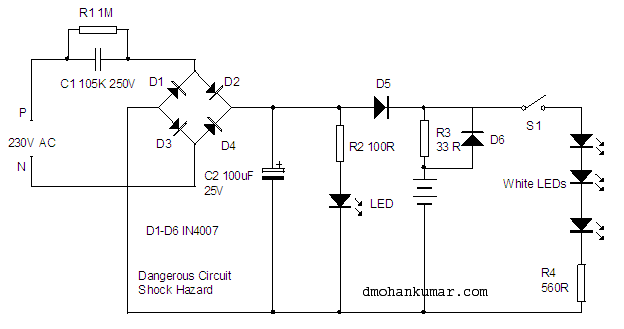 Switch on the power only after enclosing the circuit in a plastic case. Do not trouble shoot, solder or test while it is connected to AC. Always use footwear while doing work in AC circuits. Use a sleeved AC tester for screwing and unscrewing the screws. An ELCB connected switch box is ideal in work place. The most attracted topic of the present days is energy conservation, use of alternate ways to reduce cost of electronics equipments etc. You know, I bought a White LED in 2006 for Rs. 90 and now it is Rs.1 by the introduction of china products in the market. Transformer less power supply is every where now. What about Mobile charger, What about LCD TV and what about a Computer. No transformer is there. What is its reason. Two things. Transformer is bulky and there will be severe power loss due to heat. Then regarding shock hazard. Even an LKG student knows that it is not safe to touch a plug point. So people knows how to handle electricity and only who knows that will construct an AC circuit. If we are using battery only, how can we use an AC adapter without fear. I am posting the same aspect in different forms because there are lot of space for changing the design even if the basic aspect remains same. I have one critic abroad. When I publish a circuit, immediately he copy that image and post it in his website with harassing comments. Fortunately, he is giving link to my website. So I have an advantage. My site traffic increases and more and more people subscribe the updates.Every person has his own views and it is better to take it in a good spirit. But I will not moderate such harassing and insulting comments in my pages because it is not the space for popularity.